Certain questions are fundamental to almost all religions. Since the earliest days of faith, humans have turned to religion to tell them how they should live, why they should live, and what will happen when they die. Equal in importance to all of these questions is another: how will the world end? Whether it be Rapture or Ragnarok, almost all religious make some prediction about the end of the world. So too does Silinism attempt to predict, not the true end of the world, but certainly a time of general Bad Stuff Happens. Silinist scripture says that the Not Quite The Apocalypse (NQTA) will one day be upon us. The Silinist holy books predict certain signs to watch for to prepare for the NQTA. Among these signs are the harbingers of the NQTA, the Incompetent Riders of the Not Quite The Apocalypse. These four mounted apparitions will come to the world and sow something vaguely unpleasant. Texts foretell of the penguin rider, the platypus rider, the-something-we-cant-quite-identify-rider, and the giant-walnut rider. 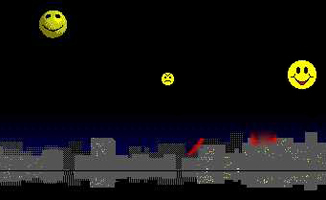 The texts tell that these harbingers shall be followed by the Three Happy Faces of the Not Quite The Apocalypse, seen here in an early drawing from prehistoric cave walls, floating high above a city skyline and beginning a rampage of slightly less than epic proportions. Note the fairly small flames flickering on top of some buildings. Other telltale signs of the NQTA to watch for include: strange things happening, other strange things happening, really strange things happening, and it not quite being the Apocalypse. To date, the following signs have been observed which foretell that the NQTA may soon be upon us. "You know, nobody's seen any signs of the NQTA for a while. I'm starting to think it might not actually be coming. Who made this one up, anyway? Was it Larry? Larry's prophecies never come true, you know that. Well, okay, let's give it another decade and see." 1999, July 4: While the writings of Nostradamus are generally very difficult to interpret, many scholars stated openly that they believed that he had predicted that the world would end on this day. When the awaited date arrives, the world fails to end. The significance of this event remains hotly debated. 1997, September: The Rolling Stones release the song Anybody Seen my Baby which clearly announces the coming of the Incompetent Riders. Close listening to the song reveals the lyrics: "Anybody seen my penguin? Anybody seen my ride?"